When playing solo piano how to play jazz chords with left hand when there is no bass player to play the roots? I have been learning jazz piano but always using backtracks for bass and playing using rootless chords. My question is if I want to play solo piano without a bass player what is the best approach for playing the chords in the left hand? Just remove the 9th and play the root like a normal 7th chord? The main type of jazz I have been playing is bossa nova. As an example, in this Dave Frank video, the chords he plays in the begining (first two elements presented). Here's what I was taught by my teacher with regards to solo piano when I was first starting off with him. It is a method to play solo piano with the chord spread out between both hands and the melody as the top note of the chord. It's definitely not the only approach to this, but it is a systematic approach that really helped me. Let's say you're playing Cmaj7 and the melody note in the song is G (just above middle C). You have one of two paths to choose, but the melody note must be the top-most note. 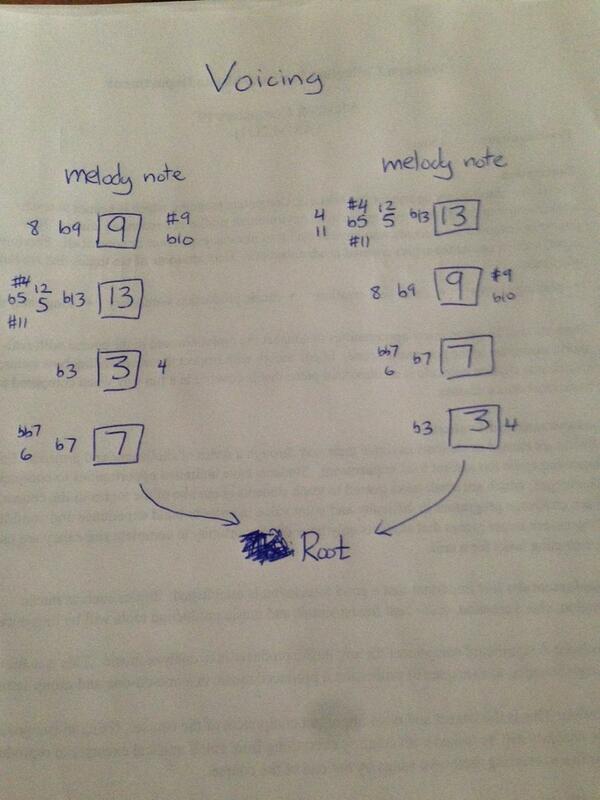 Since your melody note is the 5th of the chord, you would choose the path on the left since the 9th is the next closest. You would follow that path all the way down until you have the root. So, this is what we get when we choose the left path. If the 3rd/7th go below low C or D, move them up an octave. The same can be said for the 9th/13th, if it's too close to the melody and detracts from it or makes it sound too crunchy, drop the offending note by an octave. Like in the image below. Distribute the notes between the two hands and you're good to go. Now, all of those other options beside the intervals that are boxed are other choices depending on the chord. 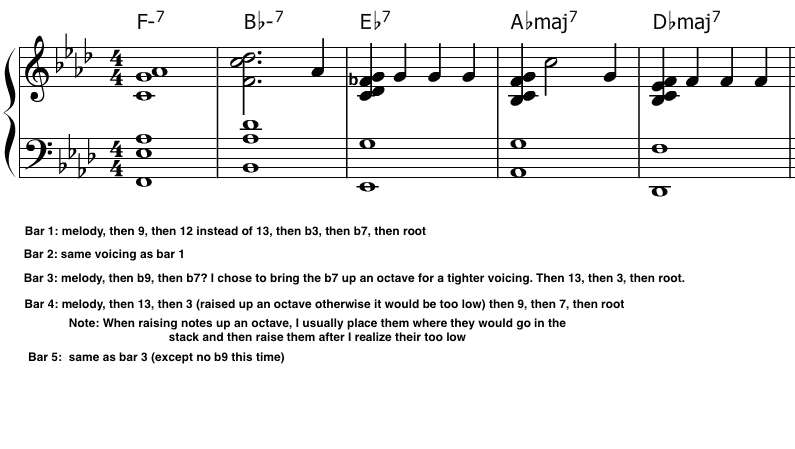 If the chord was C7 instead of Cmaj7, then we wouldn't choose 7, we would choose b7. I'm sure there are many ways to do this. Hopefully this will get you started. You've lots of low notes at your disposal! Just use them with l.h. and put the top parts of the chords in with r.h. Assuming you're accompanying a soloist of some sorts. If not, then you'll have to maybe arpeggiate 1,5 etc. with l.h. and some sparse chords along the melody with r.h.
Not the answer you're looking for? Browse other questions tagged chords jazz latin-jazz or ask your own question. what are the most beneficial drills for jazz piano?